2. How did we ever afford to do it? Here is the easy answer for number 1. YES. We generally don't like to travel without our kids. Unless we are just going on a 1-2 night(s) getaway. 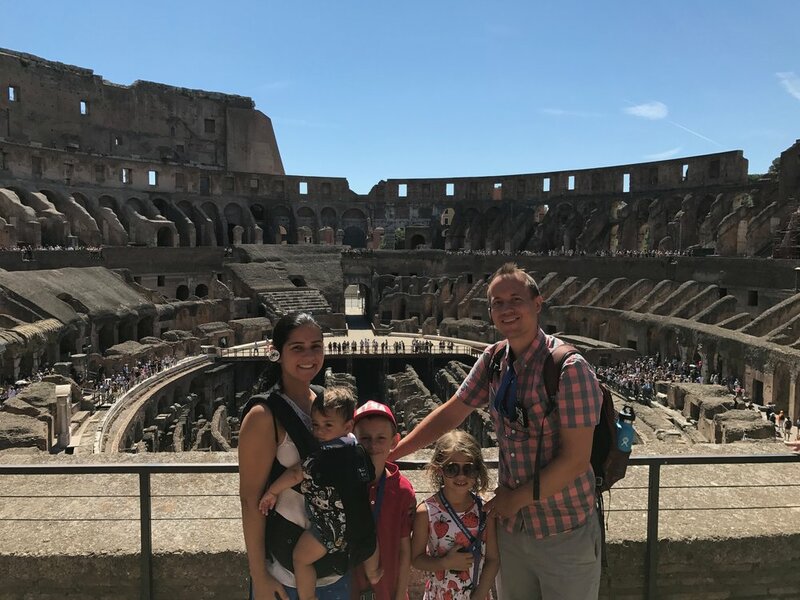 We like to call ourselves spontaneous people but I doubt we could pull off 7 months of traveling around the world with 2 very young kids without any planning. The planning process started about a year - a year and a half before we actually headed out of the country. At least that's when the idea was born. Each phase required a lot of patience (this was the hardest part for me). Phase 1 was waiting for our au-pair's term to be over. We decided not to sell our town house before leaving. Unfortunately for us, we had bought our house during the height of the market and selling it meant losing money. Instead we decided to see if we could rent it out. If you have ever rented a property you know that being a landlord is not all rainbows and butterflies. We had some interesting situations but we knew that the end goal was more important to us than the obstacles we were encountering. Renting our house meant that someone else was paying our mortgage. We moved in with my parents for a few months, right before we left and saved up the monthly mortgage amount. While we were gone, we asked a friend to act as our property manager. There were some crazy stories with our tenant but honestly we would not do it any differently. I am not saying that this is possible for everyone. How monthly mortgage was quite high and thankfully both my husband and I were employed with good salaries at the time. Not paying mortgage in New Jersey is a big deal, even if just for a few months! This was our way of making the travel affordable without touching much of our existing savings account. Surprisingly, traveling slowly, long term is cheaper than traveling short term. By traveling slowly I mean staying in each destination for at least a month. Many Airbnb hosts give an amazing discount to people who want to stay in their properly for a month. While we were in the South of Spain, we stayed at a beautiful house in the mountains, amongst olive trees. The house had a pool and a tree house, as well as a small swing set, great wifi and the the hosts were available to stop by and help us if we needed anything. This house cost us a little over $700 for the entire month! This is now our favorite way of traveling whenever possible. Not only is this more affordable but it also gives us a chance to not be tourists. We can actually learn a bit about the culture, the language and get to know some wonderful people. The best way to ensure affordability while traveling is to be flexible. This is so important that if I was writing this list in the order of importance I would choose this as #1. If you want to be successful as a traveling family AND have fun you must be flexible. Flexible with what you might ask. With Everything. Be flexible with your flight dates. Be flexible with the number of lay overs (be smart but be flexible). For example, we were able to fly from Chiang Mai to Christchurch for free (using our United Miles). This meant flying from Chiang Mai to Bangkok to Auckland to Christchurch. It was a lot for the kids but they did amazing and truly if we didn't choose to be flexible, this would have cost approximately $4000 which meant we would have never made it to New Zealand. I can't even imagine! We had such an amazing time in our RV exploring the South Island. Be flexible with your types of accommodations. Giving up some of your comforts at home, will only add to the experiences and your memories that you will all build together. Here is another example, when we went on our little road trip in Ireland, we stayed at a hostel one night, because it was cheap and affordable. It sure wasn't my favorite place but our kids loved the fact that we all had to sleep in bunkbeds! I promise that being flexible will come with some incredible surprises you wouldn't want to miss. The only other item I would mention is that it is important to set a budget. This falls under a few of the categories mentioned above. To set a realistic budget we needed to research the best ticket prices, the best accommodation prices, etc. We had to learn a bit about each of our destinations and figure out how much it would cost for us to eat each day, visit certain places, etc. We set a lose budget before we left but tightened it as our plans finalized. Have you traveled slowly? Do you plan to? Do you have any tips for us or for our readers? We love to hear from other traveling families about how they fund their nomadic journeys. When you're traveling with kids, you need to have a first aid kit at all times. You could go out and spend a lot of money on a kit from the store, but it most likely has a lot of things you don't really need to be lugging around on your travels, and it probably doesn't have all the things you actually will need. Instead, create your own first aid kid with just the essentials. Here are our suggestions on what is vital for any first aid kit for kids. Top 10 things to do in Southern France with kids, If you don't have kids we still strongly recommend everything on this list except for #6. For the month of July 2014, our family of four lived in a small cottage on a farm in Western Ireland. We were all surprised by just how much we loved this experience, and hope to inspire more families to travel here as well. Here is a list of 10 things you and your kids can look forward to with a visit to Western Ireland. While we stayed for a whole month, you can enjoy all of these experiences in a 1-2 week period.